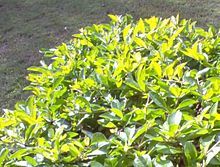 This article is about the pruning of plants in general. For the pruning of fruit bearing trees, see Fruit tree pruning. For other uses, see Pruning (disambiguation). Specialized pruning practices may be applied to certain plants, such as roses, fruit trees, and grapevines. It is important when pruning that the tree’s limbs are kept intact, as this is what helps the tree stay upright. Different pruning techniques may be deployed on herbaceous plants than those used on perennial woody plants. Hedges, by design, are usually (but not exclusively) maintained by hedge trimming, rather than by pruning. This would be an inappropriate operation if the tree species’ form was of a shrubby nature. This would therefore remove most of the foliage and would also largely unbalance the tree. This procedure should not be carried out if the tree is in decline, poor health or dead, dying or dangerous (DDD) as the operation will remove some of the photosynthetic area the tree uses. This will increase the decline rate of the tree and could lead to death. If the tree is of great importance to an area or town, (i.e. veteran or ancient) then an alternative solution to crown lifting would be to move the target or object so it is not in range. For example, diverting a footpath around a tree’s drip line so the crown lift is not needed. Another solution would be to prop up or cable-brace the low hanging branch. This is a non-invasive solution which in some situations can work out more economically and environmentally friendly. Thinning: A more drastic form of pruning, a thinning out cut is the removal of an entire shoot, limb, or branch at its point of origin. This is usually employed to revitalize a plant by removing over-mature, weak, problematic, and excessive growths. When performed correctly, thinning encourages the formation of new growth that will more readily bear fruit and flowers. This is a common technique in pruning roses and for amplifying and "opening-up" the branching of neglected trees, or for renewing shrubs with multiple branches. Topping: Topping is a very severe form of pruning which involves removing all branches and growths down to a few large branches or to the trunk of the tree. When performed correctly it is used on very young trees, and can be used to begin training younger trees for pollarding or for trellising to form an espalier. 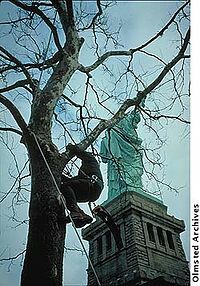 ^ "Pruning - Nelson's Tree Services". Retrieved 20 December 2017. ^ "Removal of dead wood - Nelson's Tree Services". Retrieved 20 December 2017. ^ "Crown Reduction - Nelson's Tree Services". Retrieved 20 December 2017. ^ a b "Tree Fruit Production Guide". tfpg.cas.psu.edu. Retrieved 20 December 2017. 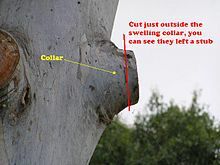 ^ "Houston Tree Care and Tree Cutting Tips". www.bigdtreeservice.com. Retrieved 20 December 2017. James, N. D. G, The arboriculturalist’s companion, second edition 1990, Blackwell Publishers Ltd, Great Britain. Shigo, A, 1991, Modern arboriculture, third printing, Durham, New Hampshire, USA, Shirwin Dodge Printers. Shigo, A, 1989, A New Tree Biology. Shigo & trees Associates. J.M. Dunn, C.J. Atkinson, N.A. Hipps, 2002, Effects of two different canopy manipulations on leaf water use and photosynthesis as determined by gas exchange and stable isotope discrimination, East Malling, University of Cambridge. British standards 3998:1989, Recommendations for Tree Work. Lonsdale. D, 1999, Principles of tree hazard assessment and management, 6th impression 2008, forestry commission, Great Britain. "Pruning" . The New Student's Reference Work . 1914.